Born in London in 1904, Wisdom was the youngest child and only daughter in a family sporting six sons. Growing up in an environment like that, it’s no wonder she wasn’t your average turn-of-the-century dame. No; Wisdom grew up full of spice and spitfire and wasn’t afraid to show her brothers what she was made of. They nicknamed her Bill since she was just one of the boys. By the time she was sixteen, Wisdom was already racing a motorbike around the streets of London. According to Fast Ladies: Female Racing Drivers 1888 to 1970, Wisdom’s parents knew she was going to be unstoppable. They tried to compromise with a safer, smaller GWK cyclecar, but that was definitely not Wisdom’s style. Before long, she had swapped it for a supercharge Lea-Francis and a Frazer-Nash. This wild, black-haired, green-eyed tomboy commanding her motorcycle caught the eye of a man named Tommy Wisdom. He was working as a journalist at a motorsport magazine and knew that this beautiful woman was going to be his partner in life. There isn’t much information about how the two first met, but Wisdom was racing cars and motorcycles casually throughout the 1920s and 30s; it seems reasonable that he ran into her at the track. Before long, the two were married. The two were a match made in heaven. Tommy Wisdom, too, had quite the wild streak—which is what led him to enter his wife in a women-only race at Brooklands without her knowledge. I’d love to see how that conversation would have went when she found out, but it proved to be the move her career needed. Wisdom won the race and went on to beat her husband at the Shelsley Walsh hillclimb the next year. In 1932, Tom conceded that his wife was faster than him and marked the occasion by buying her an enormous Leyland-Thomas touring car. This nearly 4500 lb beast was equipped with a 7.2 liter engine, and the Brooklands officials were always hesitant to let women race. She brought her brand new machine out to the track for the Three Laps Ladies Handicap Race, and they made her take a racing test in front of a panel of officials just to prove she could, y’know, drive the thing. Since women weren’t great at that. Elsie Wisdom went ahead and won the race. And just to prove her point, she took the women’s speed record for the track at 120 mph. And just to rub it in a little more, Wisdom teamed up with Australian driver Joan Richmond to take on the JCC 1000 Mile Race at Brooklands in a Riley 9. They were the only team of women to compete in what was one of the major races of the time, and they won. Easily. All the teams of men and some of the best European works teams had to shuffle home with their hands in their pockets, made to recognize that women could not only compete but also hand their asses to ‘em. Starting in 1933, Wisdom began to compete at Le Mans. She was the only woman on a six-person Aston Martin team, and it was there that she had an experience that many female race fans can relate to. As per Fast Ladies, Wisdom’s engine exploded in the middle of the night. In an era before TV coverage and constant data feeds, if you went off the grid, you were pretty much done for until your team realized you were gone and sent someone after you. It wasn’t a bad accident and Wisdom was unhurt, so she decided to make the trek back to the pits to tell everyone what happened. She spoke little French and had been warned about the, um, different sexual proclivities of the Frenchman. So, when she ran into a first aid stand, the doctor asked her what she was doing. “Voiture bang” was probably not the most articulate way to describe what happened, but the doctor’s response—to forcibly drag her into the medical tent—was pretty inarticulate, too. Wisdom went into fight-or-flight mode, although it’d be more accurate to say she probably ended up doing both. She struggled free from the doctor and immediately took off into the night. While the doctor’s intentions weren’t harmful, it can be a terrifying thing to be a woman who is manhandled at a dark track where she’s already struggling with a language barrier. In 1935, she returned to Le Mans with Dorothy Stanley Turner. The pair didn’t finish the race, but it was a comfort to work with just one other woman instead of five guys. The Wisdoms competed in racing as war approached. In 1937, a crash at the 1000 Miles saw Tommy sustain a broken leg and Elsie a smashed face. While they took part in Alpine Cup races and the Monte Carlo rally, it was a rather unsuccessful year. Which isn’t necessarily to say that women couldn’t do both—because Elsie Wisdom was a prime example of how a racing driver can find success. She was happily married and was more than happy to start a family with her loving husband. Wisdom often brought her daughter Ann to the track with her to give her little girl a taste of the speed and adrenaline that she’d loved in her own childhood. But it was difficult for Wisdom to get back behind the wheel in the post-war world. She competed in Monte Carlo rallies between ‘49 and ‘51. Disaster struck at the 1951 Alpine Cup. Elsie and Tommy were driving together when an American tourist car traveling in the opposite direction smashed into their Bristol. The pair almost died in the process, but it served as something of a passing of the torch. Their daughter Ann and her teammate Pat Moss went on to with that race—and many others—to extend the family legacy. Wisdom could recognize that her career was winding down. Her passion for the sport saw her compete in a mere handful of races after her accident, her final one being in 1955. What happened after her racing career was over isn’t well-known. Elsie and Tommy both passed away in different months of 1972, while their daughter made a name for herself in navigation throughout the 1960s. We do know, though, that Wisdom was incredible. 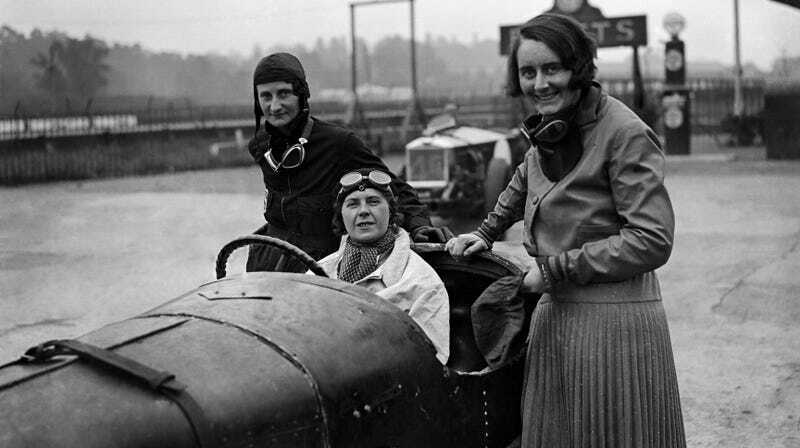 Brooklands wasn’t the friendliest track to women, and yet she still made a name for herself by proving wrong the sexist assumptions that claimed women couldn’t race. Elsie Wisdom could not only race, but she’d do it in the biggest car on the field, and goddammit, she would win. It’s a shame that her name isn’t more well-known. Her feats are incredibly impressive, and the fact that she went out of her way to prove that women can be capable racers paved a career for her in an era that was certainly not seeking out female drivers.